Renter sentiment has rebounded -- 62 percent of renters believe it's a good time to buy, a 10 percentage point increase from Q2. Eighty percent of owners believe it's a good time to sell, a new survey high. NAR Chief Economist Lawrence Yun says heightened renter and owner confidence won't necessarily translate to more sales. Why have existing-home and pending home sales faltered over the past four months? It’s an especially vexing question given that 62 percent of renters and 80 percent of home sellers believe it’s a good time to jump into the housing market, according to the National Association of Realtors’ latest Housing Opportunities and Market Experience (HOME) survey. But there may a simple explanation: NAR Chief Economist Lawrence Yun says all the confidence in the world can’t offset the effects of low inventory, lack of access to affordable homes, and increased buyer competition. August existing-home sales declined 1.7 percent month-over-month to a SAAR of 5.35 million — the lowest SAAR sales pace seen in a year. Furthermore, pending home sales didn’t fare so well this summer either. The July PHSI declined 0.8 percent month-over-month and declined 1.3 percent year-over-year — the fourth year-over-year hit the index has taken within the past five months. Yun attributes the weak existing-home sales and PHSIs to low supply, which is at a 4.5 percent year-over-year decline. “Buyer demand is robust this fall, but the disappointing reality is that sales will continue to undershoot their full potential until supply levels significantly improve,” he added. 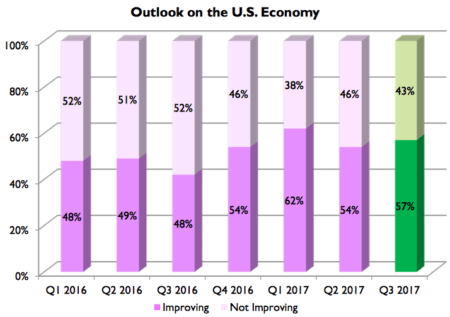 A total of 57 percent of households believe the economy is improving — a three percent quarter-over-quarter increase, and a nine percent year-over-year increase. The strongest economic optimism was found in the South (61 percent) and those with incomes of more than $100,000 (64 percent). Furthermore, for the first time, renters and homeowners in rural (63 percent) and suburban (58 percent) areas had more confidence than those in urban (50 percent) areas. NAR attributes the boost in the economic outlook to increased confidence in personal finances. Sixty-two percent of respondents believe their financial situation will be better in six months, a 4.8 percentage point increase from Q2. Although renter confidence rebounded by 10 percent, it’s not necessarily translating into sales. When choosing between purchasing a home or enduring rent increases, 42 percent of renters said they’d resign their lease, and 44 percent said they’d simply look for cheaper housing or get a roommate. Renters in the Northeast (56 percent) and renters who live in urban areas (59 percent) expect their rent to increase in the upcoming year, while the majority of renters in the Midwest (56 percent) and the South (51 percent) expect their rent to stay the same. Yun says renters are deciding to stay put because income growth isn’t keeping up with home price growth, the latter of which has risen for a consecutive 66 months to a median average of $253,500. In July through early September, a sample of U.S. households was surveyed via random-digit dial, including a mix of cell phones and land lines. The survey was conducted by an established survey research firm, TechnoMetrica Market Intelligence. Each month approximately 900 qualified households responded to the survey. The data was compiled for this report and a total of 2,709 household responses are represented.